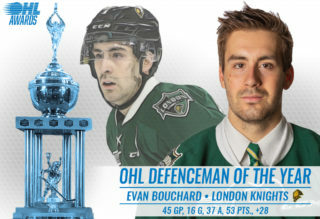 London Knights captain Evan Bouchard got in on all four of his team’s goals Friday night, fuelling a 4-3 victory over the visiting Windsor Spitfires on Sportsnet. The Edmonton Oilers first round pick put London on the board 2:27 into action before setting up Alex Formenton on a power play just over three minutes later. Bouchard tacked on a second goal midway through the game and chipped in with a helper on Alec Regula’s eventual game winner. 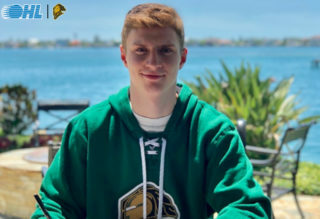 The 19-year-old Bouchard recently wrapped up his fourth OHL campaign, surpassing the 200 point plateau on his OHL career with 53 points (16-37–53) this past season. The Oakville, Ont. native has played in 29 career playoff contests, recording 18 points (6-12–18). He won an OHL Championship and Memorial Cup title with the Knights in 2016. 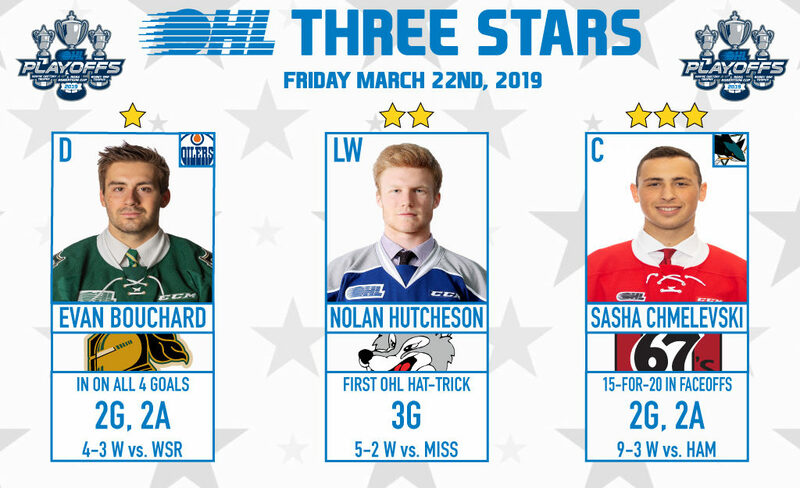 Sophomore forward Nolan Hutcheson connected with linemate Quinton Byfield three times, recording his first OHL hat-trick as the Sudbury Wolves took a 5-2 Game 1 victory over visiting Mississauga. The 6-foot-4 left winger struck three times on six shots, scoring a pair of his goals in the opening half of the first period. The Kingston, Ont. native put up 44 points (24-20–44) over 66 games this past season. 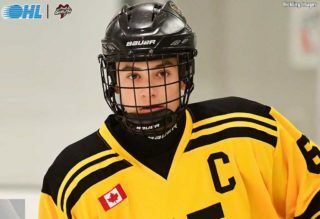 He was Sudbury’s fourth round pick in the 2016 OHL Priority Selection. San Jose Sharks prospect Sasha Chmelevski scored twice and added two assists as the Ottawa 67’s won big in Game 1, defeating visiting Hamilton 9-3. 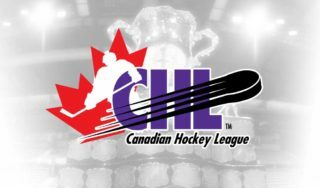 Chmelevski scored twice on five shots on goal and was 15-for-20 in the faceoff circle, increasing his career playoff totals to 13 points (5-8–13) over 12 contests. 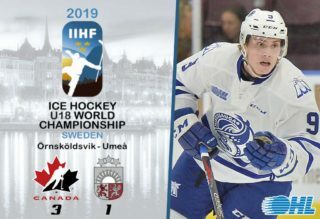 The 19-year-old from Northville, Mich. put up 35 goals and 70 points over 56 games this past season while also earning silver with the United States at the IIHF World Junior Hockey Championship. Chmelevski was San Jose’s sixth round pick in 2017.